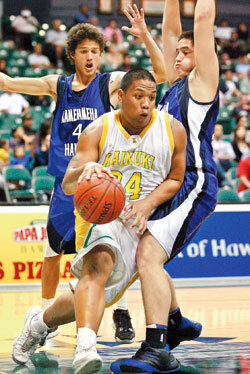 Keone Reyes of Kaimuki went baseline on Reese Alnas and Kealoha Kramer of KS-Hawaii. The Kamehameha-Hawaii Warriors seemed destined for a shot at the state title after knocking out five-time defending champion Iolani. Keone Reyes had a different view of the future. The 6-foot-1, 255-pound senior scored 27 points and grabbed six rebounds to help rally Kaimuki past KS-Hawaii 54-44 in the Division I semifinals of the Hawaiian Airlines/HHSAA Boys Basketball State Championships. Reyes, who also dished out four assists, picked up the slack as teammate Beau Albrechtson played just 21 minutes due to foul trouble. Albrechtson finished with 12 points and 11 rebounds. "We're ready to take care of business tomorrow," Reyes said of the title showdown. Kaimuki (25-8) now returns to the state final, but this time, their foe is different. Punahou, the Interscholastic League of Honolulu champion and No. 1 seed, awaits. The Bulldogs and Buffanblu will tip off at 8 p.m.
"I'm happy and I'm nervous. We've got a tall order tomorrow," Kaimuki coach Kelly Grant said, noting that point guard Brandon Madamba gives his Bulldogs a lightning-quick penetrator this time around. "With Brandon, even when he's erratic, he can break things down. You can't teach that," Grant said. Madamba had three assists and three steals, and Daniel Colon added nine points. The Stan Sheriff Center crowd saw Kamehameha-Hawaii grind out a 36-32 lead after three quarters, only to see the Bulldogs roar from behind. Reyes scored 11 points during a 16-4 fourth-quarter run, including a layup off a feed from Albrechtson that gave Kaimuki the lead for good, 40-38, with 3:45 left. Kamehameha-Hawaii (26-7), the Big Island Interscholastic Federation champion, will play Kalaheo in the third-place game this afternoon. Reyes was unstoppable on the high and low posts, and scored several times on baseline drives. "When a guy gets that hot, there's nothing you can do," KS-Hawaii point guard Mea Wong said. Kamehameha-Hawaii got 11 points from Wong and 10 from reserve forward Colton Collins. The Warriors shot just 32 percent (18-for-56) from the field against Kaimuki's matchup zone. The Bulldogs shot extremely well from the field: 61 percent on 19-for-31 shooting. That comes on the heels of their 69-percent shooting against Saint Louis in the quarterfinals. Kaimuki overcame 16 turnovers, many that came in the first half against KS-Hawaii's full-court press. The Warriors called off the press in the third quarter, however, in favor of packing in the paint with a 1-2-2 zone against Reyes. "We tried to double-team (Reyes), but we didn't get there quick enough," KS-Hawaii coach Nelson Wong said. "He's hesitant with his moves, and his (change of) speed is unorthodox. It works for him." The move to a zone helped KS-Hawaii get some rest, but Kaimuki took full advantage with good ball movement. Reyes scored on a spin move underneath, and Albrechtson hit a layup off a pass from Madamba for a 45-38 Bulldog lead with 2:34 to go. After Reece Alnas drove for a bucket with 1:32 left, the Warriors were within 45-42, but Kaimuki closed out the game from the foul line. Reyes, Albrechtson and Makalii Nahinu combined to hit 9 of 10 free-throw attempts in the final 1:15. "I'm still proud of our team," coach Wong said. "We didn't hit shots late, and maybe the moment got to us a little bit. Reyes proved why he's the guy for them." Kamehameha-Hawaii defeated Kaimuki 42-40 on Dec. 15 in a tournament at Hilo. "They were tough and already peaking," Grant recalled. KAMEHAMEHA-MAUI--Kameaaloha Wong 11, Reece Alnas 6, Isaiah Kekaualua 0, Kealoha Kramer 2, Russell Kackley 2, Hogan Rosehill 8, Colton Collins 10, Kelii Kimi 5. KAIMUKI--Daniel Colon 9, Chezz Ramos-Dias 0, Craig Cabudol 0, Brandon Madamba 0, Bryan Lim 0, Chauncey Nicola 0, Jamari Hamilton 0, Kamahoi Cookman 0, Makalii Nahinu 3, Ryan Kakitani 3, Keone Reyes 27, Desmond Tautofi 0, Beau Albrechtson 12. 3-point goals -- Kamehameha-Maui 2 (Wong 2), Kaimuki 2 (Colon, Kakitani).